Union Home Minister Rajnath Singh on Monday chaired the two-day long 67th plenary session of the North Eastern Council (NEC) in Meghalaya’s capital city Shillong.The plenary session has been started at around 2-30 pm on Monday and Union Minister for Development of North Eastern Region Jitendra Singh, Governors and Chief Ministers of Assam, Arunachal Pradesh, Meghalaya, Mizoram, Manipur, Nagaland, Sikkim, Tripura; who are also members of newly reconstituted NEC were also taking part in the session held at the State Convention Centre in Shillong. Union Home minister Rajnath Singh had inaugurated the plenary session of the NEC by lighting of lamp.Various issues related to all round development of the North Eastern region and security related issues have been discussed in the opening day of the plenary session. Delivering the chairman’s speech, Union Home minister Rajnath Singh said that Central Government is committed to ensure socio-economic development of this Northeastern region while acknowledging that people from the region have made remarkable contributions to build a modern India and the youths of this region are showing their talent in every field. “The Look East Policy has been changed to The Act East Policy. We are trying to ensure in all eight states, sectors such as infrastructure strengthening, manufacturing, trade, tourism, skill development, urban renewal, smart cities, and ‘Make in India’ get emphasized,” Rajnath Singh said.Urging the NEC to play its part in preparing a broad roadmap towards realizing the objectives of the Government’s "Act East Policy" for forging a link between India and ASEAN, Singh expressed optimism that newly set up NITI Forum for the North East would be able to accelerate the growth of the region by identifying various constraints. Calling on the Chief Ministers of the region to avail the opportunity provided by North East Industrial Development Scheme (NEIDS) 2017, which was cleared by Union Cabinet chaired by Prime Minister in March 2018, Singh said that the financial outlay of Rs 3,000 crore offered by the scheme upto March, 2020 would promote industrialization in the States of the North Eastern Region and will boost employment and create source of income. 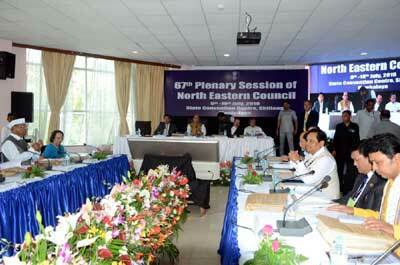 Bringing innovation to the field of agriculture of the region, formulating strategies by NEC for transformation of the 14 identified Districts of the North East as leading examples for other districts of North East Region to emulate, Ministry of DONER’s North East Venture Capital Fund through the North Eastern Development Finance Corporation Limited (NEDFi) with a corpus of Rs 100 crore are some of the other topics covered by the Union Home Minister in his speech. Acknowledging that there is a marked improvement in security situation in state of Assam, Meghalaya, Nagaland, Arunachal Pradesh and Manipur while States of Tripura, Mizoram and Sikkim are completely free from insurgency, Singh said that application of Armed Forces Special Powers Act (AFSPA) has been reviewed from time to time for taking decision towards its removal as it was removed completely from Meghalaya. On the other hand, Assam Chief Minister Sarbananda Sonowal said that the NE region remained backward for so many decades in-spite of being endowed with immense natural resources and this scenario is now all set to change with Prime Minister Narendra Modi's vision to make North East the 'New Engine' of India’s growth. “Implementation of Act East Policy by the central government is a big step towards fulfilling this vision and the region would derive huge benefits out of this policy in terms of tourism, investment and trade,” Sonowal said. Acknowledging Prime Minister Modi’s role in taking NE into the mainstream narrative of the country by terming it as ‘Astalaxmi’, Sonowal highlighted the Prime Minister’s directive to Ministers and officers of Union Government to make regular visits to the region which has resulted in tremendous push to the development of infrastructure here. The Assam CM also urged the NEC and the Ministry of DoNER to take up issues of infrastructure projects like roads, waterways, airways and telecom for better connectivity with South East Asia with cooperation of the concerned Ministries of Government of India. Highlighting the need to harness the potential of the region to become an ITES and IT hub which is crippled by poor internet bandwidth, the Assam CM urged the NEC to support BSNL in payment of rentals for initial few years so that it can bring high speed internet bandwidth to Assam and other North Eastern States from Cox Bazar landing station in Bangladesh through fibre optics.“This is going to be a game changer in propelling the region to achieve fast paced growth and catapult NE as an IT hub of the SE Asian region,” Sonowal said.“The NEC can also take up with External Affairs Ministry to simplify existing visa regime including introduction of provisions like visa-on-arrival to improve people to people contact and facilitate easy movement within SE Asia for furthering tourism, trade and commerce”, Sonowal suggested. Referring to opening of consulates of Bangladesh and Bhutan in Guwahati, Sonowal pitched for more such consulates of ASEAN countries in the city and relaxation of restricted area permit required for coming to North Eastern Region for the ASEAN countries. Sonowal also called on NEC to host a festival in each of the ASEAN countries to project the rich heritage, culture, handlooms, handicrafts, industrial and tourist potential of all the North Eastern States. Focusing on the need to address the problems of flood and erosion affecting Assam and other NE states in a holistic manner to find permanent tangible solutions, Sonowal said that proper and judicious harnessing of water resources of the region can contribute immensely to the national GDP growth. Thanking the Prime Minister for increasing the minimum support price of paddy to Rs 1750 per quintal, Sonowal asserted that all NE states are taking steps to achieve the target set by Prime Minister Modi to double farmers’ income by 2022. Sonowal mentioned that, Assam government’s ambitious scheme Chief Minister SamagraGramyaUnnayan Yojana with financial outlay of Rs 30,000 crore to be implemented in all 25,425 villages of the State. The Assam CM also put forth proposals for setting up a North East Organic Agriculture University by NEC for which Assam would provide land, an organic certification agency for the whole region and he also called for facilitating growth of bamboo-based industries here. Sonowal talked about the key health schemes of Assam Government like Atal Amrit Abhiyan covering 92% of population with annual income of less than Rs 5 lakhs for 6 critical disease groups such as cancer, heart diseases etc with cover up to Rs 2 lakh per individual. Implementation status of central health schemes like Ayushman Bharat, Poshan Abhiyan etc was also referenced in his speech. Saying that for swift implementation of Act East Policy strong and robust transportation networks in the region is most important, Sonowal informed that centre has declared 15 new national highways with length of 1025 kms apart from the 31 State roads with aggregate length of 1846 km have also been declared as national highway ‘in principle’. But he stated that implementing agency NHIDCL’s work is far from satisfactory and sought centre’s intervention in directing NHIDCL to speed up construction and at the same time maintain the existing roads in traffic worthy condition till completion of the projects.“As NEC is the nodal agency to fund key development projects in the NE States, the delay in sanctioning projects and procedural sluggishness in releasing funds must be addressed to speed up project implementation,” Sonowal said. He also suggested releasing of funds by NEC in two installments in lump sum for a year instead of scheme wise release. The Assam CM highlighted the need for inter-state as well as international cooperation for tackling insurgency activities in the region and efficient handling of security threats emanating from various terrorist outfits. Sonowal also called on NEC to play an active role in chalking out programmes for promoting brotherhood amongst communities living on both sides of inter-State borders for peaceful resolution of border disputes between the states. DoNER minister and Vice Chairman North Eastern Council Jitendra Singh gave details of NEC history and changes from time to time. He said that the Ministry has brought DoNERto the doorsteps of the North East Region.Regarding infrastructural growth in the region, the DoNER minister said that, the government is addressing the concerns of ‘Orphan roads’, common to two bordering states but not being attended by either state in the region. Enumerating the activities of the DoNER Ministry, Jitendra Singh said that the Ministry is organising ‘North East Calling’ and ‘Destination North East’ activities in different parts of the country for faster integration.The DoNER minister mentioned about the hostel facilities for NE Student at New Delhi where hostels are being set up in Dwarka and Rohini. He said that hostel for NE students in Bengaluru are also being constructed “as it is the need of the time”. The Union cabinet on June 13 last had taken decision as brought the NEC under the direct control of the Ministry of Home Affairs (MHA). The Union Home Minister is the ex-officio chairperson of the NEC and Development of North Eastern Region (DoNER) minister will be its Vice Chairman. The Governors and Chief Ministers of eight states of the North Eastern region are the members of the newly reconstituted NEC. Earlier, Rajnath Singh arrived at Guwahati airport and directly left to Shillong by a BSF chopper and he will back to New Delhi tomorrow.